Smother Goose: "The Dark Crystal"
Seriously, this movie is terrifying. Seriously. It begins with a backstory that is too bizarre and convoluted to fully explain here, much less to understand as a child, so I'll just say that there are nice, hairy-brontosaurus-looking creatures called the Mystics who must complete a crystal to defeat their evil other halves, some naked-rotting-vulture-looking creatures called the Skeksis. Helping the Mystics is Jen, a who is a Gelfling, a Posh Spice-elf-looking creature. We witness horror upon horrors (the Skeksis empress dies, Jen's parents die, various creatures are captured and beaten), and, just when we find some blessed levity with the antics of the Podlings (who look like cute hairy potatoes), they're all captured and taken as slaves of the Skeksis. 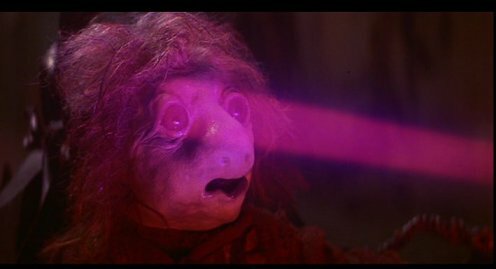 There is an evil Skeksis scientist who straps the podlings into a chair, shines a beam of crystal-light into their eyes, and drains them of their "vital essence" drop by drop, as their skin sinks in and their bodies shrivel and they are left as mindless zombies. After watching this, your children will be terrified of the eye doctor for the rest of their lives. Girl gelflings: always with wings. The Dark Crystal. Dir. Jim Henson, Frank Oz. Perf. Stephen Garlick, Lisa Maxwell, Percy Edwards. Jim Henson Productions, 1982.